Mayorine Cottage is a traditional Caribbean cottage in the Morningstar area of Nevis, close to Montpelier Inn and Hermitage, and at the end of an old plantation road and no through traffic which makes it very private. 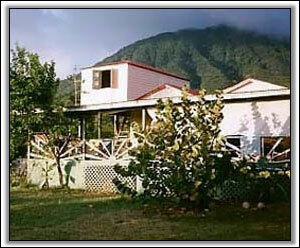 The front of the cottage faces the southwest and has a view of the Caribbean Sea and the back of the cottage has spectacular views of Nevis Peak. The property has remnants of an old homestead and the gardener has tried to plant with this in mind. Mature sour orange and cashew trees, banana and papaya, along with a massive shady ginnup tree and flowers in bloom all year, bring nature within immediate reach. The older parts of the cottage are 130 years old. The owners, both artists, have preserved the look and integrity of that original construction while updating it with modern conveniences. 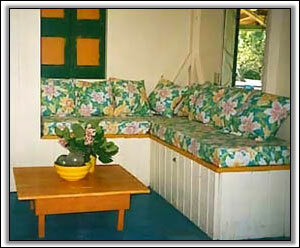 Inside the open plan kitchen and living area is decorated with a bright West Indian flair. 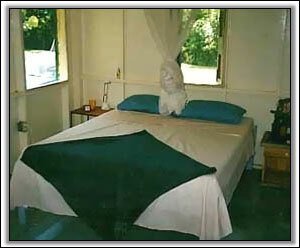 Both main bedrooms are spacious with queen size beds. The third loft bedroom with two twin beds is a "chattel house" that the owners moved to the property and hoisted to its second floor location. 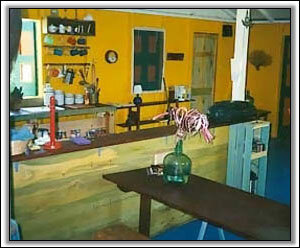 The oldest part of the cottage is the center, which was the Bath Village general store. It was moved here in two pieces, placed on a new deck and then the porch unites the old and the new. 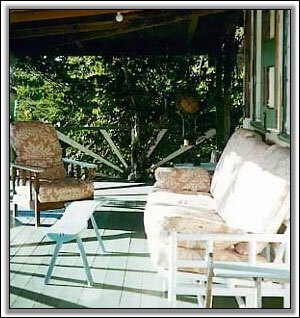 Most of Nevis living takes place on the porch and our porch is great -- over 600 square feet with a hammock, and old cast-iron bathtub (fully functioning), cushioned chairs & couch, and a large table that seats eight. Car rentals and airport pickup can be arranged with our caretaker. It is necessary to rent an SUV/jeep due to the condition of the short road to the cottage. A cleaner and a cook can be arranged to suit your needs. We can provide you with food and drink for your arrival for a nominal charge. 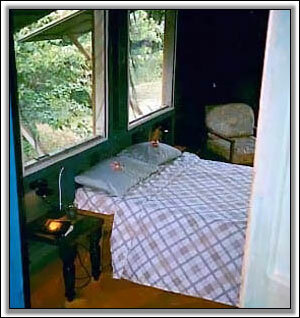 Reservations for Mayorine Cottage are held for 72 hours pending receipt of 50% deposit by check or money order. A receipt of payment and information sheet is mailed out upon receipt of deposit. Balance due 30 days prior to arrival in Nevis. Credit cards are not accepted. Cancellations made 45 days prior to arrival will result in a refund of the 50% deposit less a 15% booking fee. No refunds for cancellations made less than 45 days prior to arrival.